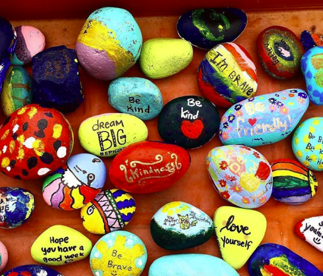 Students in Moscow, Kettle Falls Participate In "Better World Day"
These are some of the 'kindness rocks' painted and distributed Friday by Palouse Prairie Charter School students in Moscow, Idaho. Tens of thousands of K-12 students around the country spent part of their Friday doing community service projects. That included students in Moscow and Kettle Falls. They’re part of a non-profit organization called EL Education, for expeditionary learning. The organization dubbed today Better World Day. Fourth graders from Moscow’s Palouse Prairie Charter School visited the Nez Perce Indian Reservation in Lapwai to meet students and elders, to learn about Native history and to plant plants that had been donated by local businesses. Other students, such as sixth grader Morgan Deming, painted what they call Kindness Rocks and placed them all over town. This an example of the service learning projects done by students in the EL Education schools. Palouse Prairie teacher Greg Pierce says his students have done a variety of work. They made a presentation to a local affordable housing committee, offering ideas for helping residents in a mobile home park that may close. In the Kettle Falls School District today, students from the elementary to the high school levels had a variety of projects, such as working in a city park and a new elementary school playground, hanging birdhouses and reading to children at the local library.